Att göra bokomslag åt andra författare är väldigt kul, för varje omslag är unikt och ger mig olika kreativa utmaningar. Nyligen gjorde jag detta "retro"-omslag till Tora Greves SF-roman HAMMERSLAG (TiraTiger Förlag 2017). Jag delar monter A01:52 med Tora Greve på höstens Bokmässa, där jag ska presentera och sälja den kommande fjärde boken i serien DARC AGES - De mörka tidevarven. Och nu ska jag göra fler SF/Fantasy-bokomslag. (Se även min essä "Hur man gör ett bra (eller dåligt) bokomslag".) Önskar du att beställa ett proffsigt utformat omslag till din nästa roman, till ett mycket rimligt pris? Kontakta mig! (OBS: Jag är nästan fullbokad med uppdrag fram till Bokmässan i höst.) -A.R.Y. Tora Greve. Möt henne på Bokmässan! Helgen 26-28 maj besökte jag årets nationella kongress för fantastik-fans, Kontur 2017 (eller "#swecon2017" på ungdomens hippa slang). During the May 26th-28th weekend I visited Sweden's annual convention for Science Fiction/Fantasy fans: Kontur 2017 (that's "#swecon2017" in the hip jargon of those teen-agers). Kontur 2017 took place at Clarion Hotel Gillet, in the beautiful city of Uppsala. I didn't have that much time for sightseeing, but I visited the nearby medieval cathedral, to take photos and get inspiration. Because I had to attend my book table, I missed out on many interesting events, and most of Ann Leckie's appearances -- to my eternal chagrin. But I did catch the dialogue panel "How To Write Male Characters", where Ann Leckie and Kameron Hurley riffed on all the dumb things they have heard about "how to write female characters" and "female writers". Their take was to flip the gender on said dumb statements. For example: "If you have more than one male character, it becomes a story only about gender!" Or: "Every time I give male writers advice about how they should write male characters, they listen! I can tell they're listening, because they get very quiet." Kameron Hurley is widely recognized for writing "grim and dark" Fantasy and SF (and it is -- I've read it). When I met her, she came across as a laid-back, humorous and warm person. This bashful, stuttering fanboy asked the GoH if he could take a photo with her for his convention report -- and she gladly accepted. - "Fictitious Scumbags" (Panelists: Per C. Jørgensen, Markus Sköld, Kameron Hurley, Karolina Fedyk). Authors discussed the fact that the "scumbag" characters tend to get readers engaged, and how hard it can be to write good "noble" characters. - "How We Do To Get Anything Written" (Panelists: Anna Vintersvärd, A.R.Yngve, Thomas Årnfelt, Eva Holmquist, Eva Holmquist, Nina J. Lux, Kristina Hård). - "Marketing of Fantastic Literature in Sweden" (Panelists: Jenny Zunko, Eija L. Schüssler, Ylva Spångberg). 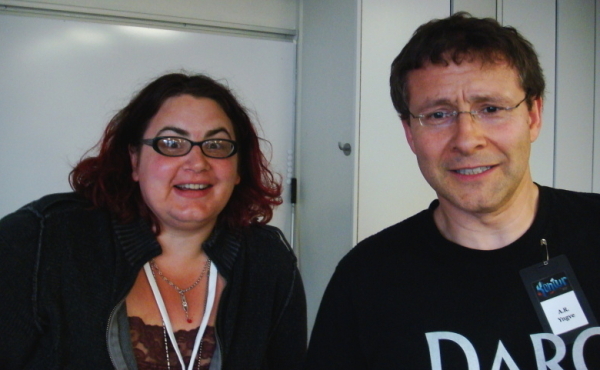 The panel members came from the areas of translation, publishing and bookshops. Each had something interesting and educational to say about the tricky marketing issue. -"Dystopias" are now a literary category in bookshops, and many don't think of it as "SF" at all. Real scientists (who are also SF fans -- there's a considerable overlap between the communities) talked about wild, crazy and grand ideas. Which SF vision might soon come true? What real science sounds too incredible to be true? - Guest of Honor Panel: "On Worldbuilding" (Panelists: Kameron Hurley, Ann Leckie, Siri Pettersen, Nahal Ghanbari). Hurley and Leckie had different approaches to worldbuilding. Leckie described hers as systematic (even including charts for traveling speed -- on foot, on horseback, etc.) , while Hurley's was less so. Memorable quote (Ann Leckie): "Being a writer is like having homework for the rest of your life." - "The Realism Conundrum" (Panelists: Siri Pettersen, Kristin Thorrud, August Aronsson, Lennart Jansson). Historian August Aronsson made the very interesting point that depictions of "medieval" societies may get the physical details right, but often fail to describe the psychology of a different era. 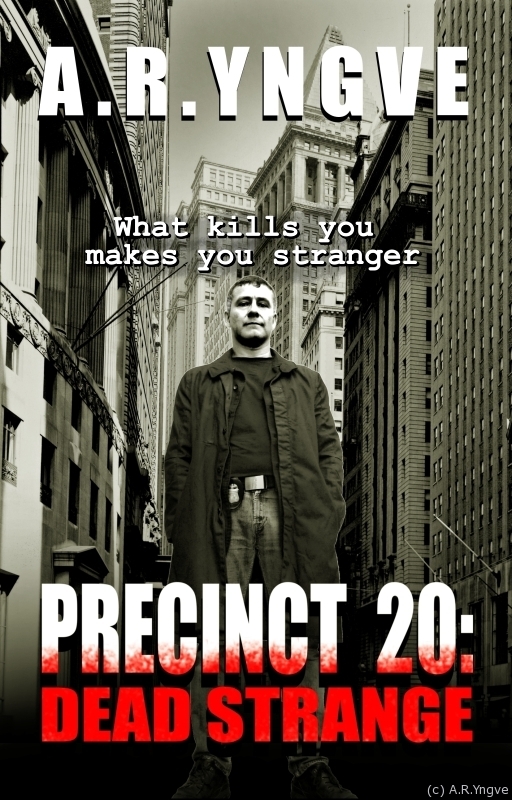 Writers tend to place "modern"-minded characters in an ancient setting. People long ago did not think the way we do today. - "Monsters As Metaphors" (Panelists: Anna Jacobsson Lund, Markus Sköld, Kristina Hård, Anna Vintersvärd). - "What Do We Do After The World Ends?" (Panelists: Sten Rosendahl, Boel Bermann, Oskar Källner, Katarina Norrgård, Elin Holmerin). 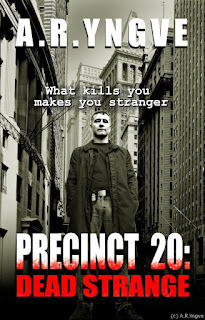 The assembled writers discussed post-apocalyptic fiction and related dystopian fiction. A rhetorical question was put to test the panel: "Is humanity worth saving?" Oskar Källner replied yes: "We are the only ones we know who can ask that question." The panel seemed to be in agreement that even if civilization died, humans would still have stories and myths -- or make up new ones. 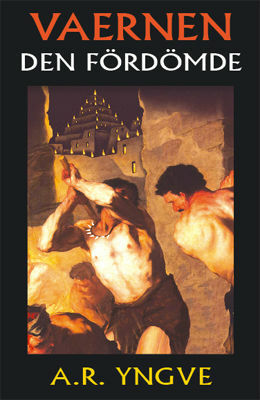 Sten Rosendahl recommended the Swedish novel Toffs Bok. Boel Bermann mentioned Oryx and Crake as an example of humans making up new myths after an apocalypse. I'm usually the kind of shy guy who leaves the party early. Friday and Saturday night I went back to my cousin's place to sleep. Here is a snapshot of the road near my cousin's place, around 11:30 PM... and a passing UFO in the foreground. Kontur 2017 was a great occasion to mingle, press flesh and chat with other SF/F fans. 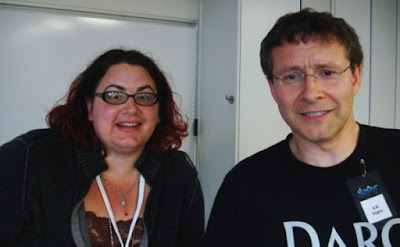 Anders Bellis and I discussed which rock musician should be in my next SF novel. "Marilyn Manson?" I suggested feebly. "Lemmy!" he replied -- and who could argue with that? I managed to get a seat in the Kaffeeklatsch with GoH Siri Pettersen, a phenomenally popular Norwegian Fantasy author. Read her books before the movie version is released! Hey... haven't I seen you and that mechanical bird somewhere before? That's right -- it's Kristin Thorrud, who I also met last year in Gothenburg at the steampunk convention SteamCon (see my SteamCon report HERE). Since I took my time and spent three whole days at Kontur, I got to meet plenty of other visiting writers and artists. That is especially rewarding, since I rarely get to gather with colleagues, do "shop talk" and share experiences and advice. This dude is going places... well actually, he's already been places. The Kontur 2017 con committee was: Anna Bark Persson, Nahal Ghanbari, Anna Davour, Isabelle Vernersson, Linn Liljemo, Johan Anglemark, Jessica Elgenstierna, Tomas Cronholm, Sigurd Hafthorsson and Maria Nygård (not shown here). Let's also thank the army of volunteers ("Gophers" in fan slang) who did their part to make Kontur 2017 a benchmark event. Extra shout-outs to: John-Henri Holmberg, Ben Roimola and Jayson Utz. 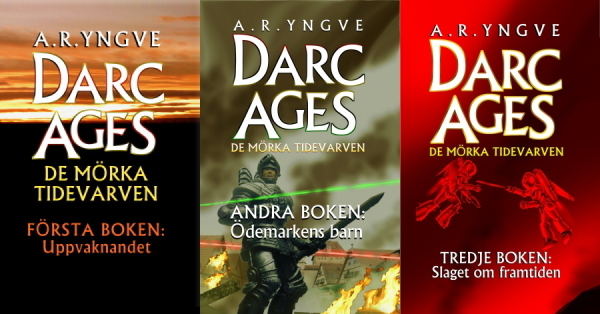 Ny recension av bokserien "DARC AGES - De mörka tidevarven"
Bloggen Mest Lenas Godsaker gillade den första boken i min episka serie DARC AGES - De mörka tidevarven... och har nu läst och recenserat fortsättningen Andra boken: Ödemarkens barn. "Är i alla fall jätteglad att jag testade att läsa denna serien för den var så mycket bättre än jag förväntade mig. Jag kommer att sälja och signera DARC AGES-böckerna på SF/F-kongressen Kontur 2017 i Uppsala (26-28 maj). Jag ska snart gästa SF/F-kongressen Kontur 2017 (26-28 maj), med eget bokbord -- och nya böcker att visa fram och sälja. Dessutom deltar jag i en panel med andra svenska författare. 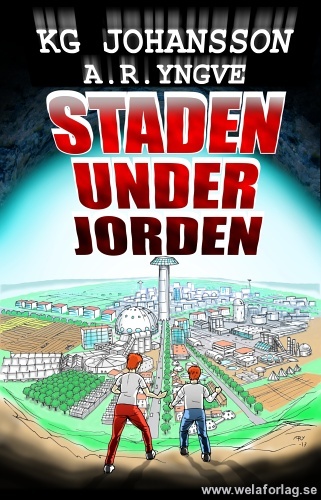 - STADEN UNDER JORDEN -- en helt ny SF-barnbok som jag illustrerat åt författaren KG Johansson. - DARC AGES - De mörka tidevarven, del I-III -- en "space opera" med illustrationer. - MONSTER I MASSOR -- en humoristisk, illustrerad sagbok för barn och vuxna. - Restupplagan av VAERNEN DEN FÖRDÖMDE -- en mycket mörk, kritikerrosad fantasyroman för ungdomar och vuxna. Psst... en sak till! 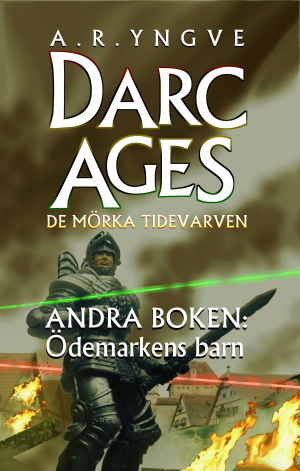 På bokbordet ska jag presentera den kommande nya boken i serien DARC AGES - De mörka tidevarven, "Fjärde boken: Maskernas stad". Den ska släppas under Bokmässan i höst -- men på Kontur 2017 kan du få en super-exklusiv första smygtitt! 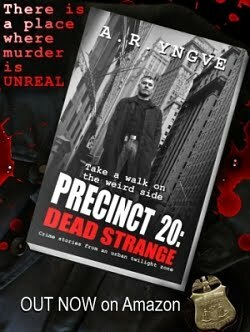 Ny skräckföljetong på Wattpad: "The Man Who Fell Out"
På Wattpad publicerar jag en serie skräckhistorier och "okonventionella" deckarnoveller under samlingsnamnet PRECINCT 20: DEAD STRANGE. Nu startar en ny skräckföljetong i den serien: "The Man Who Fell Out". 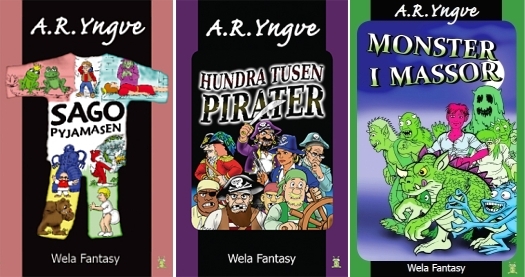 Novellen har tidigare publicerats på svenska i antologin SCHAKT 004: KRÄLANDE CTHULHU och andra bedrägliga blindskär (2007), samt på min webbsajt.